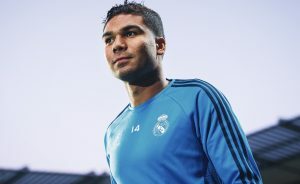 There are reports in the press that both Manchester United and Paris St-Germain and battling for the services of renowned midfielder Casemiro from Real Madrid. The reports, in both the Spanish and British press point to Neymar as the driving force for PSG’s interest in the midfielder. The Brazilian star rates his compatriot very highly and believes he will fit in well with the team. Unfortunately for PSG, there is heavy competition from Manchester United. The Los Blancos’ defensive midfielder has a huge fan in Jose Mourinho, and the coach is willing to make Casemiro one of the highest paid players at the club. Casemiro, however, is very happy with his current position, so tempting him away from Real might not be all that easy. Jose Mourinho hopes to tempt the midfielder away from Real Madrid in two ways. The first is to offer him an extremely tempting €290,000 a week, the same as Paul Pogba. The other is to sell the challenge of playing in the Premier League. Real Madrid has a watertight contract with Casemiro until the end of 2021. However, there are fractures in their relationship. The club is showing its frustration with the increasing number of errors creeping into his game this year. From Casemiro’s perspective, a move abroad would make sense. As a player, he has achieved everything he can at Real and might be in the mood for a fresh challenge. At PSG he would cement the core of Brazilian players and work well with the existing defensive midfield.